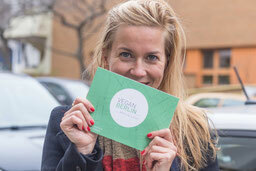 If you are a vegan, Berlin is probably the best spot to get all vegan options you would dream of. Berlin has become very vegan friendly in the past years with lots of stores and restaurants which offer exclusively vegan choices. Not only food but you will find clothes, accessories and even vegan hair dressers. With Paulina and Claudi – we checked out the best spots for a vegan day in the German capital! Let us take you on a walk through our city. The cutest vegan bistro in Moabit. 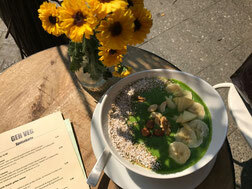 A special place to have a great vegan breakfast platter, delicious smoothie bowls, amazing bagels and in summer self made vegan ice cream creations like cucumber and basil flavor. Plus you get to cuddle the owner’s little dog that loves all the guests. This is the best place to by handmade cosmetics free from any kind of preservatives. 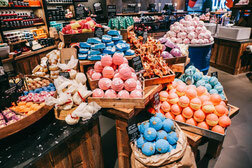 Lush has been fighting animal testing for a long time. This store simply sparkles from the outside and inside. Lovely shiny soap stones, many aromatic cremes and peelings that any person would love are to find there. If you want your hair to be done the vegan way which means with the usage of product brands that abstain from animal testing then this studio is the right one. The hair dresser Veganja makes sure you get a great consulting and excellent results! 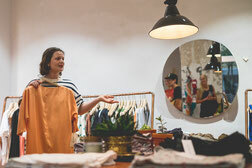 If you love vegan and sustainable fashion this is the right store for you! Here you can find everything you need for your vegan outfit: t-shirts, jeans, sweaters etc. Since 2014 this store in Friedrichshain offers great products and even an online shop. Check it out. You have always dreamt about vegan shoes? Awesome! This store offers a great number of vegan and fashionable shoes for men, women and children. Leather free but good quality options as shoes made our of gore-tex and hemp or leather-free hand bags are only a few examples of what the store has to offer. A must for vegan shoe lovers. Who says you cannot have a döner kebab if you are vegan? 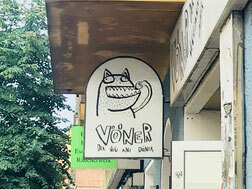 Located in the heart of Friedrichshain Vöner offers soy döner with different types of breads, organic fries and lovely sauces as peanut and tahini sauce. The neighbourhood’s urban flair makes it even more special. 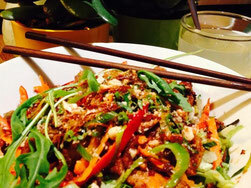 This place with primarily vegetarian Vietnamese cuisine offers a great number of lovely vegan options for a surprisingly affordable price! Super tasty and creative dishes like marinated tofu served in wild betel on thick rice noodles with lemongras and soy sauce are to find on the menu. As a drink you can get plenty of homemade lemonades with or without sugar. No alcohol served! People who prefer the eastern part of the city find a second store in Friedrichshain. This place is a must for every vegan gourmet. Its modern vegan food creations are made from seasonal, organically farmed vegetables and lot of love to the detail. 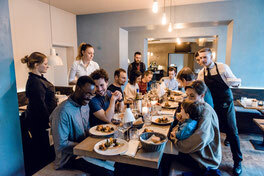 If you want to taste a creative three-course menu for a special price then the shortly introduced “come together’s” every Monday to Thursday evening are a good option. Besides they offer a fantastic brunch from 9:30 to 16:00 every weekend. If you want to find more hidden gems of Berlin, check out my folding maps BertaBerlin and QueerBerlin, BeautyBerlin, GDRBerlin, BeerBerlin and YogaBerlin. They are available in well-chosen locations all over Charlottenburg, Neukölln, Kreuzberg, Mitte and Prenzlauer Berg in Berlin and online. But for those of you, who want to stay up to date, feel free to follow me on INSTAGRAM, FACEBOOK or register for my NEWSLETTER BertaNews. Thank you to my dear co-writer Paulina Czujko, who helped me scouting and writing this piece! I met her in Berlin on one of my KiezWalks, because she studied Nutritional Sciences here, but in September she will be my base in Hamburg and open the Hot Yoga Studio 'Hot Yoga Norderstedt'.